A dozen protesters calling for immigration reform were arrested today outside U.S. Rep. Cathy McMorris Rodgers' office downtown on Post Street. Spokane Police Spokeswoman Monique Cotton says the protesters were arrested for "pedestrian interference" (an umbrella term the department also uses to refer to interference with vehicular traffic) after sitting in the street. Officers were directing traffic around them until "it was becoming a safety concern," Cotton says. "There was too much traffic and too much interference," she says. 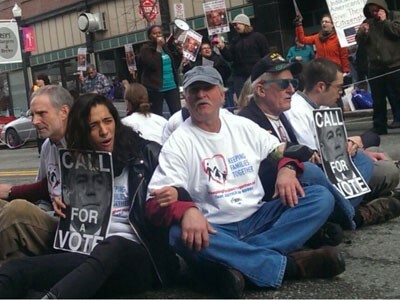 OneAmerica, the Seattle-based group that organized the protest, said in a statement the activists were, "joining a rising and raucous chorus across the nation that is calling on Speaker [John] Boehner to hold a vote this year on immigration reform that includes a pathway to citizenship. Over 100 local residents — including immigrant families, students, and workers, faith leaders, advocates, and small business owners — joined them in solidarity to put on public display the moral crisis we are facing every day with our broken immigration system." Both police and a OneAmerica spokesman said the action was peaceful and protesters who were in the street cooperated when arrested. They are currently being held downtown, though it is unclear whether they'll be booked into county jail or released with citations. UPDATE: Those arrested were booked into the Spokane County Jail, according to an SPD news release. The action comes at a time when immigration reform appears stalled in Washington D.C., in part, some like Idaho Rep. Raul Labrador say, because of the recent contentious budget battle between Republicans and the Obama administration. Read more about McMorris Rodgers' position on immigration reform here and here. Find our in-depth story about one local illegal immigrant brought to the U.S. as a child here.